Travel much? All too often, we find our family adventures will take us off to adventure new and exciting experiences with very little time to prepare for the journey. Near or far, one of my tried-and-true parenting hacks is to have my kids, a little prepared in advance with their own personalized collection of items and activities to tote about in my Mommy Bag or in their backpacks. We've organized a basic list of a few tech-free items ideal for individual and group entertainment when on-the-go. Technology certainly has its place in supporting education and entertainment, as does open ended free play. Putting to good use, we include inexpensive, random (leave faves at home) toys and items gathered from about the house, birthday party favors, and even adding in a few surprises discovered outdoors (after a good washing!). 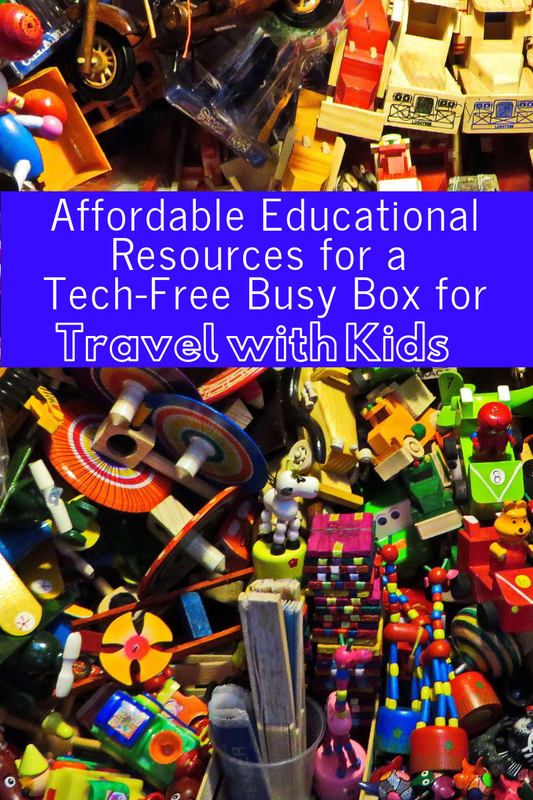 When planning your next adventure- big or small, round up these affordable educational resources for a tech-free busy box for travel with kids. So, here we go! It's time to head off to conquer the world, or perhaps just to lunch with friends at the local restaurant. Fill up and upcycle an empty wet wipes container, pencil case, or small box or zippered bag, sturdy enough to endure being toted around in the car or on public transportation. 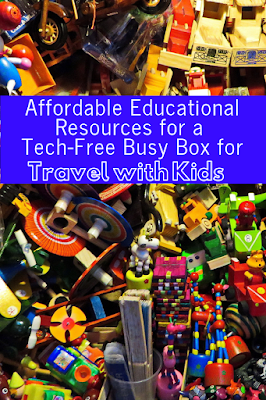 Keep it simple and economical, bring toys that your kids will enjoy playing with, yet are not too sentimentally attached to in the event some wayward toy ventures off solo, not making the return trip home.